From present tense to the subjunctive, verbs are used in a number of different ways. Education.com’s Pronoun-verb agreement exercises, along with a host of other verbs exercises, games, and worksheets, will help students understand just how they can incorporate verbs into their sentence, while ensuring their conjugation remains accurate. With regular practise, students will be able to easily utilize verbs in an array of tenses. Eliminate a common error in speaking and writing with this exercise that teaches pronoun and verb agreement. 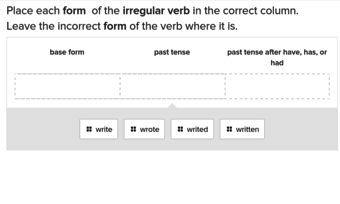 Help students connect the dots on the sometimes confusing subject of linking verbs with this exercise. Help students spice up their statements with action verbs that bring colour to each sentence. Students will be able to add a layer of complexity to their verbiage with this exercise that introduces helping verbs. English is full of exceptions, and this exercise gives students an introduction to some of the many irregular verbs. The list goes on, and with so many irregular verbs, this helpful exercise brings a few more to your students’ attention. Help students stay focused on their future with this simple exercise that will give them mastery over the future tense. Show students how verbs can be used to add more character to a statement using descriptive verbs. Show students how to describe an action in the recent past with this exercise on past tense verbs. Students with a strong foundation in the present tense of verbs will be able to better understand other tenses. Don't make things tense in your classroom when learning the difference between present and past tense verbs. These exercises allow your students to practise matching subjects and verbs independently. In addition to different tenses, helping, linking, and descriptive verbs, there are many other types that need review. Challenge your fifth graders with these exercises that contain incorrect verbs that need to be corrected. Hints give your students the help they need to learn while retaining the lesson. Using descriptive verbs will add more colour to any comment, and this exercise shows students how to incorporate them. Get in on the action with verbs, the part of speech that tells you what a noun did. Verbs can be as clear as "run," "danced," or "singing," or they can be a little more complex, like "thinking" or "was." But just because we use verbs all the time doesn't mean they're easy to remember! If verbs have your child all mixed up, help them enter the wide world of verbs with our stash of verbs exercises. We have quizzes for every grade that learns verbs, in styles from multiple choice to drag and drop, to help your student get the most out of language arts learning. Our topics range from beginner fare like past and present tense, to more advanced verb usage like linking verbs and subject-verb agreement. Once your kid has hit their verb-learning target, have them really challenge themselves by working on Adverbs. Verb mastery is just a few clicks away here at Education.com.